Happy Valentine’s Day and greetings from the most lovely Eco Lodge in Serengeti, Tanzania! It’s been the most amazing trip ever and I am just stunned by beauty of Serengeti and the spectacle of the great migration! It is only obvious that in the future we will be concentrating more and more on East-Africa safaris aside with World’s great mountain regions. We’ve now been here for close to three weeks. Started the trip on Jan 29th by flying to Nairobi and doing a 4-day Mount Kenya trek first. Everyone reached Point Lenana, the 4985-meter trekking-summit of the mountain and got unobstructed views over the rocky Batian and Nellion peaks as well as over the surrounding plains. Part of the group then continued onwards to trek Kilimanjaro for which we also got to welcome a second group to join us. We did a 7-day variation of Rongai route camping two nights at the base of Mawenzi Peak. This way everyone was extremely well acclimatized which is not at all that obvious on most Kilimanjaro itineraries and most Kilimanjaro operators. The weather, however started being a small issue from here onwards. We set off on our summit-bid on the morning of 9th. It soon started snowing heavily after our departure and closer to the crater rim we got, the heavier the wind picked up. Once up at crater rim at Gilman’s Point (5685m.) we got hit by the strongest winds I have ever faced on Kilimanjaro. In fact, it was stronger than on many peaks I have ever been on. There was no way safely crossing the last stretch on the crater rim from Gilman’s Pt. to the highest point at Uhuru Peak (5895m.). Chance of someone getting hurt or frostbitten was just way too big for a supposedly fun trek such as this one. I am however very happy about our team’s performance and spirits. Everyone of them would have easily made it all the way to Uhuru Peak and once again it was proved that our itinerary and guides can offer you best possible changes to summit the highest point of Kilimanjaro, conditions permitting as they normally do. We have got every single one of our members to crater rim and until now 97,5 % of them to Uhuru Peak. This is not the case for most operators or on Kilimanjaro’s average success rate. 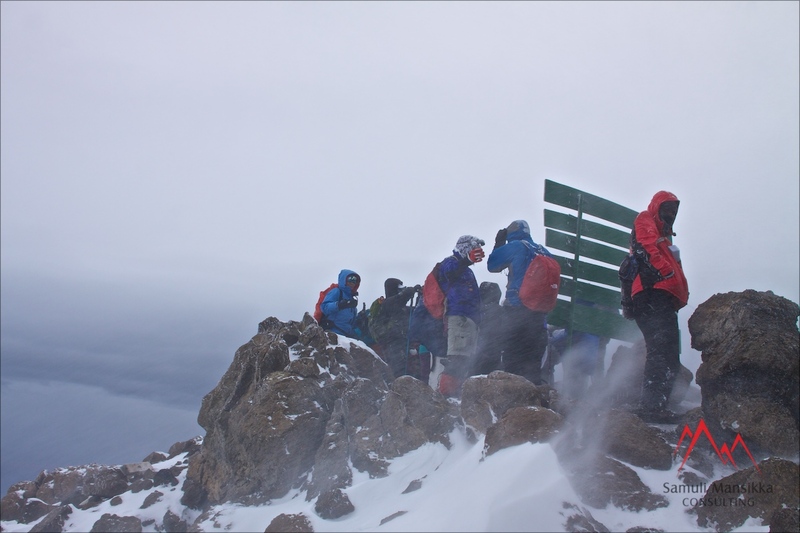 We later heard that no one team was able to get to Uhuru Peak that day. So strong the wind was! Since then I have been guiding Aventura’s safari here in Northern Tanzania. We first did a gamedrive in beautiful Tarangire National Park. Got to see elephants, an incredible amount of birds, dikdiks, Grant’s and Thompson’s gazelles, giraffes and even a leopard! The second day we did a morning gamedrive at Lake Manyara which always is awesome for birds. Giraffes, impalas, buffalos and others as well. The afternoon we spent at Ngorongoro Crater which definitely is one of World’s most amazing features! As the biggest complete caldera in the World it holds an incredible amount of animals inside. Got to spot lions, jackals, hyenas and of course their preys in huge numbers. We also managed to see not less than 5 of crater’s 17 black rhinos! Yesterday we drove across Serengeti to meet the great annual migration of 2 million mammals. I can easily say I have never seen anything like it before! It is a magical thing and one of World’s natural wonders. I really think everyone should visit Serengeti at least once. Among the wildebeests zebras, gazelles and antelopes, we spotted a bride of lions at Simba Kopjes and also leopards on two separate occasions. I am absolutely stunned by beauty, diverseness and the amount of animals here in Serengeti! We are here for another two days and finishing the safari with a day at Arusha National Park. I can’t even imagine what more we will encounter? I’ve been adding some photos on Instagram. From the travels I also tweet every day. Please browse for samulimansikka.com later on for photos on the recent Mount Kenya & Kilimanjaro trek as well as for safaris at Tarangire, Manyara, Ngorongoro and Serengeti!